This task collects the final, approved interface text for the ERI RC page changes. This is the most updated and authoritative source. Use this for coding and all QA. Contribution quality predictions What's this? Highly accurate at finding almost all problem-free edits. Finds most flawed or damaging edits but with lower accuracy. Finds half of flawed or damaging edits with medium accuracy. Highly accurate at finding the most obvious 10% of flawed or damaging edits. 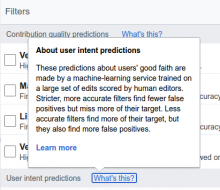 User intent predictions What's this? Highly accurate at finding almost all good-faith edits. Finds most bad-faith edits but with a lower accuracy. With medium accuracy, finds the most obvious obvious 25% of bad-faith edits. Editors who aren’t logged in. Fewer than 10 edits and 4 days of activity. More than 30 days of activity and 500 edits. All changes except your own. Edits made by automated tools. Edits made by human editors. Edits not marked as patrolled. Edits the author labeled as minor. Edits not labeled as minor. Edits that make new pages. Records of pages being added or removed from categories. Edits that originate in Wikidata. Select a color to highlight this property. Experience filters find only registered users, so this filter conflicts with the “Unregistered” filter. This filter conflicts with one or more Contribution Quality or User Intent filters. Quality and Intent predictions are not available for logged actions. This filter conflicts with one or more Contribution Quality or User Intent filters. Quality and Intent predictions are not available for Wikidata edits. On the Recent Changes page (only), all Wikidata edits are designated as “minor.” So the “Wikidata edits” filter conflicts with the “Non-minor edits” filter. The “Unregistered” filter is conflicting with one or more Experience filters, which find registered users only. The conflicting filters are marked in the Active Filters area, above. The “Logged actions” filter is conflicting with one or more Contribution Quality or User Intent filters. Quality and Intent predictions are not available for logged actions. The conflicting filters are marked in the Active Filters area, above. The “Wikidata” filter is conflicting with one or more Contribution Quality or User Intent filters. Quality and Intent predictions are not available for Wikidata edits. The conflicting filters are marked in the Active Filters area, above. The “Minor edits” filter is conflicting with one or more Type of Change filters, because certain types of change cannot be designated as “minor.” The conflicting filters are marked in the Active Filters area, above. These predictions are made by a machine-learning service trained on a large set of edits scored by human editors. Stricter, more accurate filters find fewer false positives but miss more of their target. Less accurate filters find more of their target, but they also find more false positives. 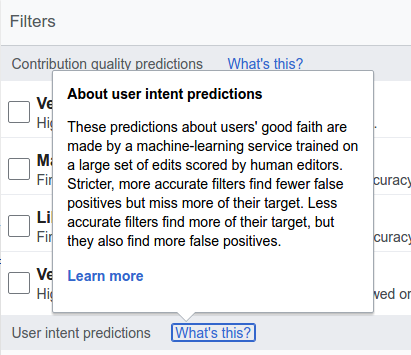 These predictions about users' good faith are made by a machine-learning service trained on a large set of edits scored by human editors. Stricter, more accurate filters find fewer false positives but miss more of their target. Less accurate filters find more of their target, but they also find more false positives. Review edits on Recent Changes using an easier and more powerful interface and many new tools, including predictive filters powered by ORES, a machine-learning program. Review edits on Recent Changes using an easier and more powerful interface. Includes new filters, user-defined highlighting and other improvements. It has been pointed out to me (thanks @Etonkovidova !) that the tooltips above are on the long side. This will be especially true in cases where the filter hovered over has a long description text (which we'd intended to proceed the diagnostic tooltips). The descriptions are the standard tooltips displayed when users hover over a filter tag. But displaying them in front of the explanatory tooltips will, literally, get in the way of the important diagnostic info that the tooltips are meant to convey to the user. It's very easy to imagine a user taking one look at that long block of text and just baling out. For this reason I'm suggesting that we omit the filter descriptions when these specialized tooltips are shown. I'm going to edit the texts above to omit the descriptions. @Pginer-WMF, if you disagree, please speak up. @Mooeypoo, I'm pinging you in case you've started implementing the tooltips. I'm sorry, I'm super confused now. I am not sure I understand the distinction you're making in the above comment, though. I don't understand the meaning of "displaying them in front of the explanatory tooltips will, literally, get in the way of the important diagnostic info that the tooltips are meant to convey " -- displaying in front of what? And for "For this reason I'm suggesting that we omit the filter descriptions when these specialized tooltips are shown." -- are the "specialized" tooltips the ones we show when filters are in "exclusion" mode? Sorry, I'm a bit confused and I want to make sure that we implement not only the ability to have popups, but the correct behavior with changing popup text, and make sure I understand what the popup text depends on. @Mooeypoo, answers, yes and yes. See, you're not confused at all! are the "specialized" tooltips the ones we show when filters are in "exclusion" mode? The ["SelectedFiltername"] filter has no effect currently because its results are a subset of “Filtername b.” Consider highlighting with a color to distinguish. Ok. So we consider that when the tooltip includes information in a sentence form, including the filter description makes it too long. That makes sense. On the regular case, the description is useful to clarify what the filter is about, but information about conflicts can take precedence. Finds half of flawed or damaging edits with medium accuracy. Has no effect currently because its results are a subset of “May have problems.” Consider highlighting with a color to distinguish.' The "Likely have problems" filter has no effect currently because its results are a subset of “May have problems.” Consider highlighting with a color to distinguish. Has no effect currently because its results are included already by “May have problems.” Consider highlighting with a color to distinguish. This omits the filter name and explicitly mentioning it is a filter. It also uses "includes" instead of the more technical "subset" concept. Regarding the "Edit authorship" filters, @Etonkovidova points out that these filters cover many "Types of change," as we are terming them, beyond what we usually mean by "edits." It's also true that these changes may be by bots, which are not usually thought of as "users." Spelling these points out will clarify that these two filters cover the totality of recent changes (total coverage). See the two proposals below. Edits created by other users (not you). Edits and other changes by you. Edits and other changes by bots and others (not you). Changes by bots and others (not you). Contributions by bots and other users. Your own edits and other changes. Changes by other users and bots. I think the key here is to imagine what these filternames will look like out of context, as tags in the display area. Based on that, I think I like #4, Changes by others/Changes by you. It's also shorter than some. In the descriptive text, I know we normally try to state the positive effect, but "All changes except your own" is really the point here, isn't it? So why not just say it. There is one issue with the conflict messages still, I explained and proposed a solution at https://phabricator.wikimedia.org/T156427#3031396 . Proposal #2B ===Contribution authorship Your own contributions Changes by you. Contributions by others Changes by other users and bots. The more I think about it the more I like "changes" instead of "contributions" in the tags. This is the "Recent Changes" page. So, Changes by you/Changes by others will be logical I think. Also, do bots make "contributions"? Is blocking someone what most people imagine when they say "contribution"? How about something like 4b, below. Edits and changes by other users and bots. Also, do bots make "contributions"? Is blocking someone what most people imagine when they say "contribution"? Bots are users technically, and I think some people perceive them as users. Bots definitely make contributions however you define it. For instance, many of the U.S. city/town/county articles were created by https://en.wikipedia.org/wiki/User:Rambot , which helps maintain them to this day. Bots also do things like help maintain the project space (organizing maintenance backlogs and such). Some bots do blocks/protect/etc., but they're the minority. Another possibility is "Edits and changes by others", with "others" including both humans and bots. I'm ok in using either changes or contributions. The former proposal was using both the more high-level (contribution) for the tag name and describing it with the more specific (changes) in the description. I think that makes sense, but I won't oppose doing it the other way around. What I found confusing about 4B is mentioning both "edits and changes" since by trying to clarify too much introduces ambiguity: "your own (edits and other changes)" vs. "(your own edits) and (other changes)"
I updated the Tooltip and Results Area Messages above to put Wikidata Edits back in as something that could conflict with ORES filers. Moriel looked over the texts, so they should be appropriate technically. The ["SelectedFiltername"] filter is shown in gray because ["Filtername a”[, “Filtername b” and “Filtername c"] [is/are] canceling its effect. I don't think we discussed this. This has similar i18n issues as the messages for the conflict states. Also, this should only be for full-coverage groups. You are right! This this applies only to full-coverage groups. I updated T149391 to reflect that. Thanks. I've rewritten the message below to address what I think are probably your problems. Does this work? If those work for you, go ahead and copy them to the Description, above. Thanks. I implemented the feature with this message, but I think it'd be less awkward if we didn't put the list of filters at the end. (Joe said that Matt said they had to be at the end, I'm not sure if that's right or why that's the case.) Also, I think this message needs to be shorter, see T156864#3090189. ...and having seen the other messages that are supposed to appear in on-hover popups (the "all selected" one and the various conflict ones), I think those are way too long as well. Since the result area conflict messages largely duplicate the on-hover conflict messages (and in some cases are shorter(! )), I'm questioning whether we even need on-hover conflict messages at all. I didn't see any need to change the ORES subset filter, though I know Roan is making them generic. Basically, to avoid translation problems. It's a similar solution to what we used for the Echo wikis. It may be possible to put it elsewhere, but please make a proposal so we can evaluate that. @Catrope and @Mattflaschen-WMF, As requested, I've shortened both of the No Effect messages somewhat. I hope it helps. I've copied these to the description. jmatazzoni mentioned this in T156864: RCFilters: Implement 'subset' property for filter items. Catrope moved this task from QA Review to In Development on the Collaboration-Team-Triage (Collab-Team-Q3-Jan-Mar-2017) board. @jmatazzoni approved going back to the old Results Area message (I just edited it), due to some technical issues. He mentioned maybe wanting to say 'red' again, but @Mooeypoo wants to discuss that further. "The “Wikidata” filter is conflicting with one or more “Contribution quality” or “User intent” filters. 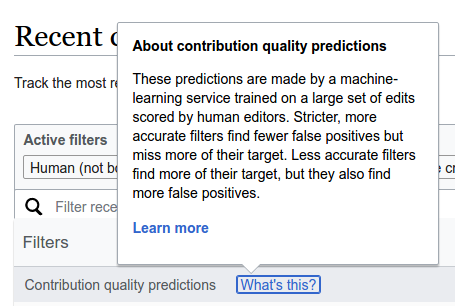 Quality and Intent predictions are not available for edits from Wikidata. The conflicting filters are marked as inactive above." or something like that for the results area Wikidata conflict message? It's a minor variant of the one we discussed (which was about logged actions) at standup today. Thanks Matt. I've added a message for this to the Description above. @Mooeypoo, I shortened the 'What's This' texts considerably (from 70 words down to about 50). Let's see how these look in situ. That looks good to me. Thanks Roan. jmatazzoni created subtask T160803: Implement corrected Conflict State tooltips and Results Area messages. Checked in betalabs - all text labels seem to be in place. I saw no issues related to display or functionality. jmatazzoni reassigned this task from jmatazzoni to Mooeypoo.